'The Fool' is the ultimate card of new beginnings, innocence and potential. Numbered zero in most decks The Fool signifies the beginning of the journey through the Major Acarna, which represents the journey of life and the paths we all must chose between. The fool is care free, innocent and at the beginning of his creative potential. He is blind to the future and lives in the now. 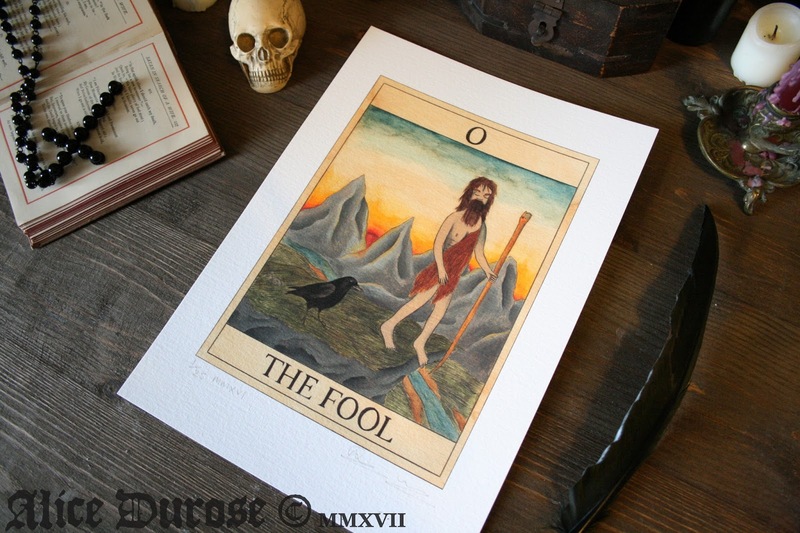 In a reading The Fool can represent a new beginning or journey and stepping out into the unknown, taking a leap of faith or that there may be choices laid before you. The Fool's lesson is to trust your heart and follow it, however ridiculous it may seem, trust the universe and its plan for you. Traditionally in Tarot 'The Fool' is portrayed as a court jester-esque, clueless looking figure, often with torn trousers and a small dog biting at his behind. A common theme is the impression that 'the fool' is walking blindly, about to fall from a precipice. He often carries a staff or walking stick and a bindle (a sack containing his possessions - a la puss in boots). This suggests that the Fool is on a journey and carries with him his entire world. In Rider-Waite many of these common themes remain, however the Fool appears far more carefree and flamboyant in appearance. Added symbolism also includes a white rose, symbolising his innocence and purity, and the rising sun represents new beginnings. The Rider-Waite interpretation gives far less of an impression of mockery than some other decks, and portrays the Fool in quite a positive light, closely reflecting the meaning of the card. When designing my Fool I had two had two concept directions which I considered approaching from; that of a court jester style fool or that of a wildman style innocent. I decided to go with the latter idea, as I felt it had a lot of scope to be developed into an interesting piece differing from most interpretations, and I liked the idea that it also had suggestions of the beginnings of the human race and our early innocence and potential. I chose to loosely base the portrayal of my Fool on the stereotypical caveman. Clothed only in fur, it suggests that his material possessions are few, they are of the earth, found by him and are only used out of necessity. It also hints at inexperience and naivety, as he has no provisions for his journey through life (represented by the mountains), and no protection from the elements the universe may throw at him. If he is to survive he must adapt. His staff, is danger hidden in plain sight. Though it may appear to him to be of no concern, it is in fact the form of a snake, ready to strike and turn upon him and his ignorance to danger. The Fool steps forward unconcerned, he is blind to the dangers of the world and the pitfalls of life, with his eyes firmly closed he does not see the drop at his feet, or the beauty of the sunset behind him. As the first card in the deck 'The Fool' ties in many recurring elements within my Tarot series. The mountains often used to represent life's journey, a difficult path, power or danger. The river flows through may of my Tarot, also symbolising the flow of life and its path. These two elements also represent the masculine phallic and the female fertile symbols. The crow, a feature of the series not only because he is my favourite bird, but because throughout history he had been used to represent death, wisdom and knowledge. In the case of 'The Fool' the crows part has to perspectives; he is the guardian through the Major Acarna. A protector and a guide always at hand to whisper his council and timeless wisdom in mans ear. Or the alternative view, as a carrion bird, he follows the Fool, waiting for him to make his error of judgement and fall to his doom. He uses his wits and wisdom to wait silently in the wings for an easy meal from the carefree Fool. As my last Tarot Art in Focus post, I would like to take the time to thank anybody who has read any of these insights. It has been quite an interesting, often therapeutic experience to explain the thought processes and in depth symbolism behind my Tarot series. The series was a huge undertaking, not just in the creation of the pieces (155 hours work), but also in the research required and the time working on concepts (none of which was timed), and I hope that these posts have reflected this. My artwork is an eclectic mash of all the things which make me who I am; films I love, books I've read, people I know, things I think, and I hope that somewhere among the 22 posts of rambling detail and nonsense, that this could be seen.